"Instead it should be a strong area of focus to determine if indeed there is a valid "parapsychological" connection, whether it is about the interaction with some sort of advanced technology, or is a folly of misinterpretation or misrepresentation." 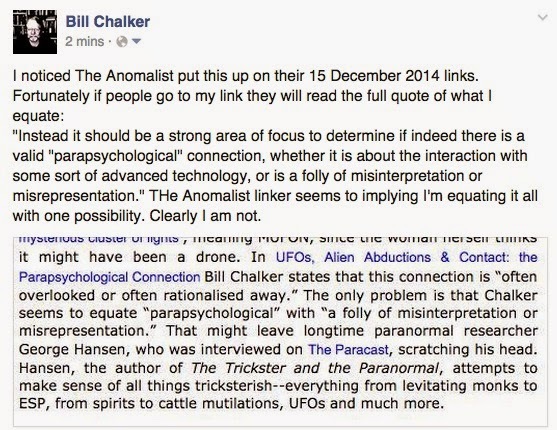 The Anomalist linker seems to be implying I'm equating it all with one possibility. Clearly I am not. I somehow don't think George Hansen would be scratching his head over this. Sure, he would probably come up with a broader range of possibilities. So could I. I would suggest there are many so-called "parapsychological" events that would fit these 3 options and more. Science progresses by the collection and assessment of data. Hypotheses to explain the data are considered and if they are verifiable then viable theories can emerge. In UFO research that scientific perspective has had a variable history. The quality of data varies enormously, with much of it falling far short of what might reasonably constitute scientifically evaluated UFO data. In an article in “Frontiers of Science” (an interim publication in the journey of IUR (the International UFO Reporter) May-June 1981, Dr. J. Allen Hynek identified the problem. “All we have are abortive, often amateurish attempts at data gathering, data analysis, and feeble attempts at laboratory studies (on a charity basis, of course), all of which dwindle into inconclusion and frustration … It is my contention that “hard” data may well have been present in many UFO cases but their discovery and definitive establishment has repeatedly gone by default for lack of professional (funded) treatment. It has always been the case of “too little too late,” necessitated by the use of volunteers bolstered only by their unselfish devotion to the pursuit of an overwhelming mystery,” Hynek concluded. Dr. Hynek lived to see the beginnings of some “thorough, professional study” in the work of GEPAN, specifically the Trans-en-Provence UFO landing physical trace case of January 1981. Indeed, given access to the GEPAN files, at the direct invitation of the French government, he found all of the GEPAN cases to be very well investigated. In my column "Science and the UFO controversy" I highlighted how the GEPAN organisation (in the form of its current incarnation GEIPAN) hosted a workshop to discussed optimal ways to improve investigation and the acquisition of viable UAP/UFO data. All of these tools should be taken up by UFO groups, where practical, as it will improve the quality of the data we have and help us to assess further the rich data already collected. The creation of an encyclopedia of UFO data arranged chronologically helps the assessment of the UFO data particularly if it is accompanied by rich social data and historical context. This sort of material provides insights into the methodology in the past, contemporary with the time of investigation. We can then use the benefits of experience to reassess the data and make more informed assessments. Correlations in the data can be better assessed over long periods of data. Correctly assessed data can be important scientific finds if they have been correctly assessed and the patterns established are consistent over a large body of data and a lengthy period of time. Apart from the obvious benefit of displaying all the data amassed by groups over a long period of time it helps reveal the impressive work of those who have gone before and appropriately acknowledge their legacy. The benefit of a large historical cross-section of UFO data gathered by as broad and comprehensive range of players can equally assist the interpretation of data and patterns. 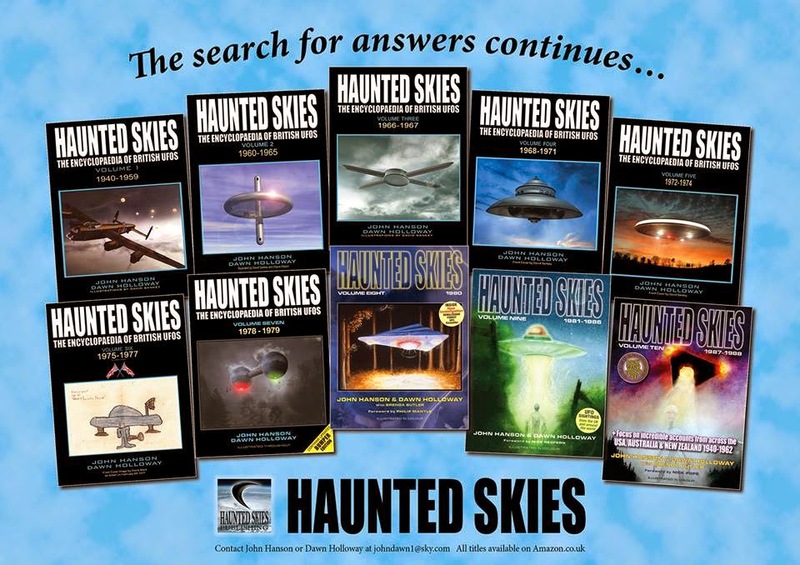 John Hanson and Dawn Holloway have created just such a broad encyclopedia in their impressive book series “Haunted Skies – the Encyclopedia of British UFOs”. As of November 2014 Volume 10 has just emerged. I have volumes 1 to 9 and they all contain a rich picture of the periods they cover with sightings data, investigator and group data, social history and occasional correlations with oversea cases. Having access to this rich cross-section of raw data and original material provides interesting insights not only in the nature of reports being received but also how they were investigated, or sometimes how they were not investigated. They also reveal the ebb and flow of sightings data reinforcing the broad picture of flap cycles and the spread of types of cases such as close encounters versus more distant reports. What is even more impressive is that John Hanson and Dawn Holloway have achieved an impressive level of assistance and contributions from a lot of different groups and individuals. Their series of books provide a good template of what could be achieved here if the right sort of cooperation can be achieved. A lot of data has been lost with old groups that have ceased to operate and where researchers have withdrawn from the field or passed away. Keith Basterfield’s extensive cataloguing activities also provide a useful guide for the development of an encyclopedia series, where his summary entries can be flesh out with whatever original data can be located. The closest comparison to the Hanson/Holloway British encyclopedia series is the one volume compilation “The Jarrold Files” put together by Ufologist magazine editor Robert Frola back in 1990. 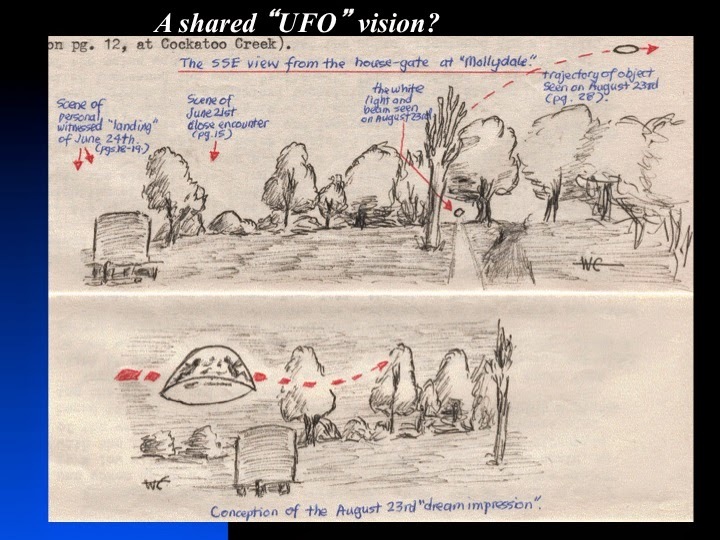 While billed as based on “the sightings record collection of UFOR (Qld), it was more comprehensive than that drawing on case material and occasional social history, news clippings and broader research reviews from various parts of the Australian UFO community. It covered up to 1979. Robert Frola and Daniel Sims have been working at creating a more extensive series tentatively titled “The Almanac of Australian UFO Sightings” and have indicated that they are planning a first volume that may take us up to the end of 1944 or perhaps 1946. This will be an ambitious series and I felt it would benefit immensely if broader assistance, cooperation and contributions can be provide by all UFO groups and individual researchers across Australia. 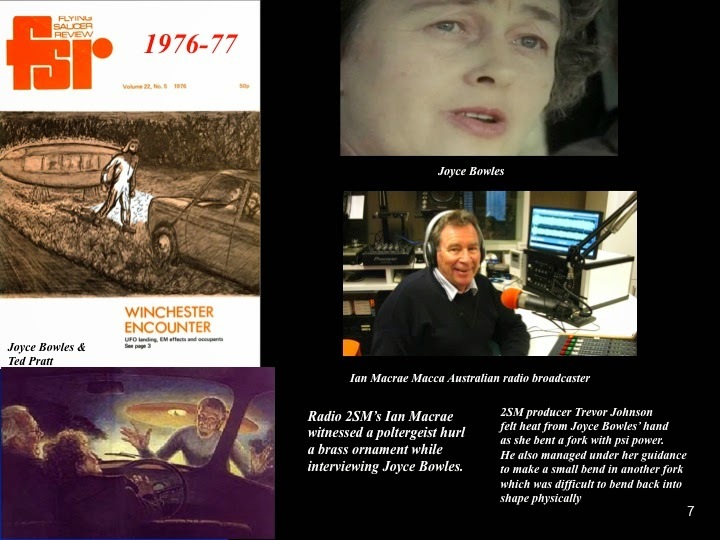 More recently I learnt that Larraine Cilia and Dominic McNamara had had contact with John Hanson and Dawn Holloway and gotten permission to use their title “Haunted Skies” of their envisaged Australian encyclopedia series. While it would be interesting to see different takes on the same type of project – an encyclopedia series on Australian UFOs, I suggested to both parties that a cooperative and shared venture would possibly work better. I described what Robert Frola had achieved with the one volume of The Jarrold Listings. Given that listing, the AUFORN database which also reflect the work of a cross-section of Australian researchers and groups and that Robert and Daniel have already begun, Larraine agreed it would be useful to discuss a cooperative venture. I firmly hope that a cooperative venture to produce a multi-volume Australian UFO encyclopedia series can be achieved. I would certainly assist and contribute to that sort of team effort. I look forward to this exciting project moving forward with the hope that an extensive measure of full group cooperation can be achieved, which would reflect a great level of maturity and evolution of inter-group relations. We are a big country and no one group or individual can easily achieve this big and important project. It may be that a more efficient way to achieve that goal is to develop a broad task force that can develop strategies to achieving the end result. 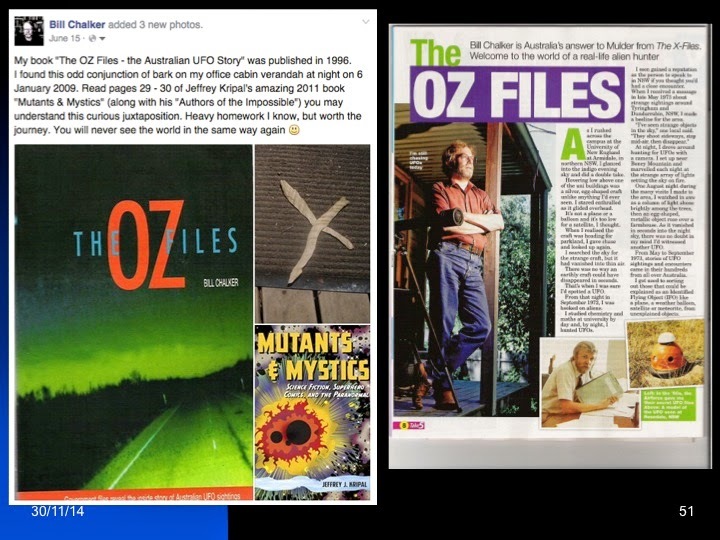 Perhaps what is needed is an Australian UFO History Group modelled on the UFO History Group that produced the mammoth book "UFOs and Government". Good luck with this important project. You have my support. Now, lets get it done – an Encyclopedia of Australia UFOs. 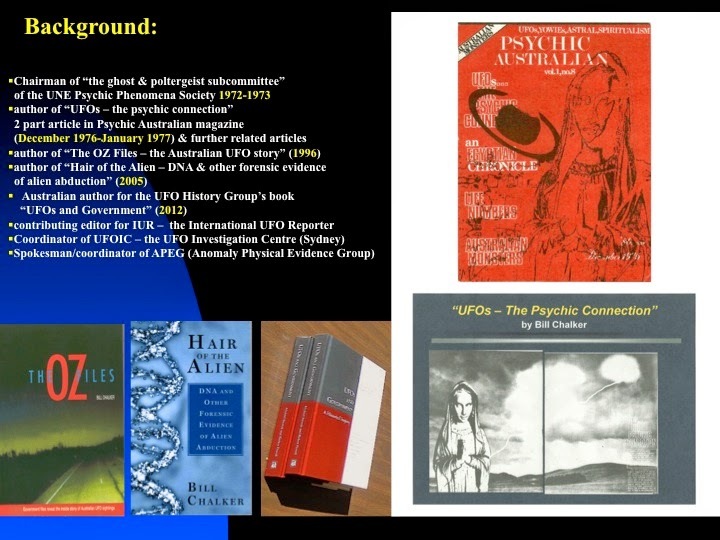 A lecture I gave to the Australian Institute of Parapsychological Research in late November 2014 was an opportunity for me to address an area in UFO research that is often overlooked or often rationalised away. Instead it should be a strong area of focus to determine if indeed there is a valid "parapsychological" connection, whether it is about the interaction with some sort of advanced technology, or is a folly of misinterpretation or misrepresentation. 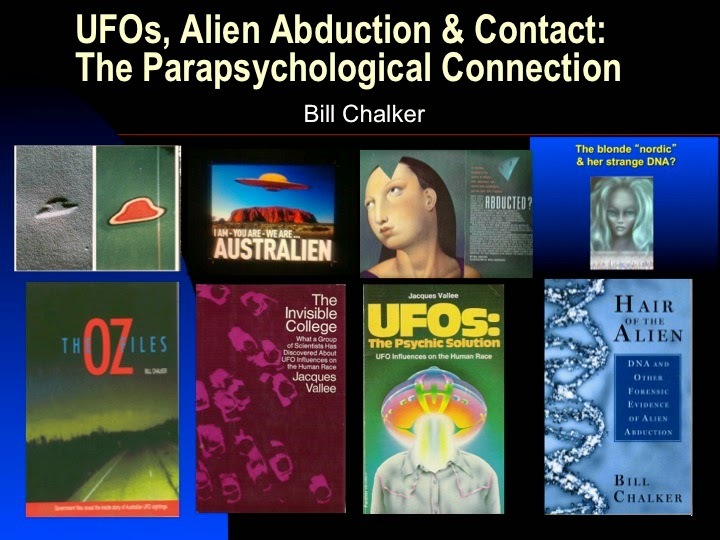 Drawing on a wealth of anthropological, historical and contemporary research and investigation, the evidence for parapsychological connections in UFO, alien abduction and contact experiences is examined. With a focus on the Australian experience, events as diverse as the 1868-1873 experiences of Parramatta surveyor and alderman Frederick Birmingham, other historical events, the aboriginal shamanic experience, intense UFO flap experience (such as at Tyringham, Kempsey and Mount Butler near Armidale, some experienced by the author), poltergeist type experiences (such as at Boyup Brook, WA) in contemporary close encounter cases, and abduction and contact type experiences are examined. The DNA mediated case study of Peter Khoury and a biological sample implicated in an alien abduction milieu yielded extraordinary DNA evidence that led to a long-term study of an alien DNA paradigm hypothesis and the book Hair of the Alien (2005). Intriguing parapsychological dimensions in this and other case studies are described. 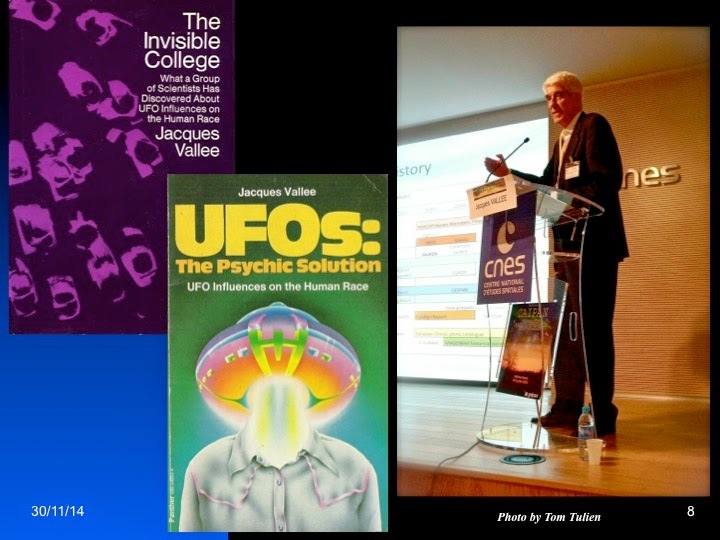 A recent case study examined by the author and Robb Tilley reveal an extraordinary mix of parapsychological, UFO, and alien abduction/contact motifs, that argue for a compelling case for the physical reality of these experiences, including possible "implant" and "missing fetes" evidence. 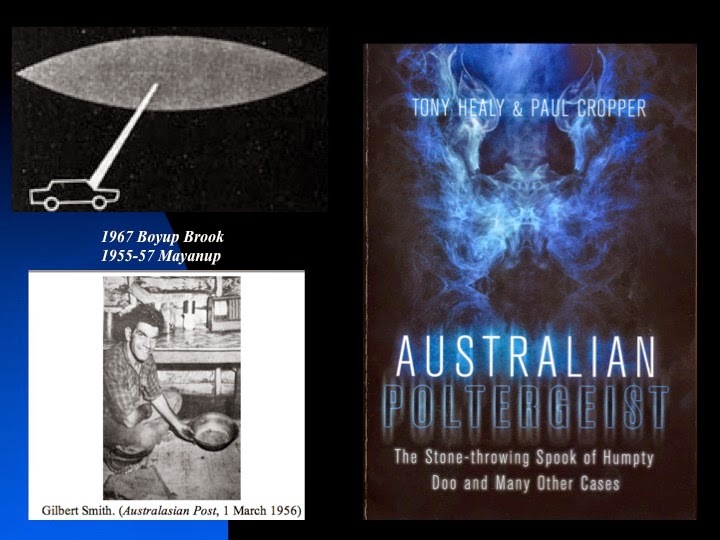 The area around Boyup Brook and Mayanup in south western Western Australian has had a strikingly unusual focus of interest in this area of a possible parapsychological connection. At this locality particularly 1955-57 there was an extraordinary stone-throwing poltergeist outbreak, which even had "min min" light activity associated with it. The area has also had striking UFO activity, one of the most interesting being a "solid light" "car stop-control" close encounter near Boyup Brook in 1967. My friends Tony Healy & Paul Cropper have just come out with a great book on the "Australian Poltergeist" experience. I highly recommend it as an excellent overview of this fascinating area of human experience. Tony and Paul rate the Mayanup- Pumphery and Boyup Brook events as "the most impressive" in their bulging polt files. 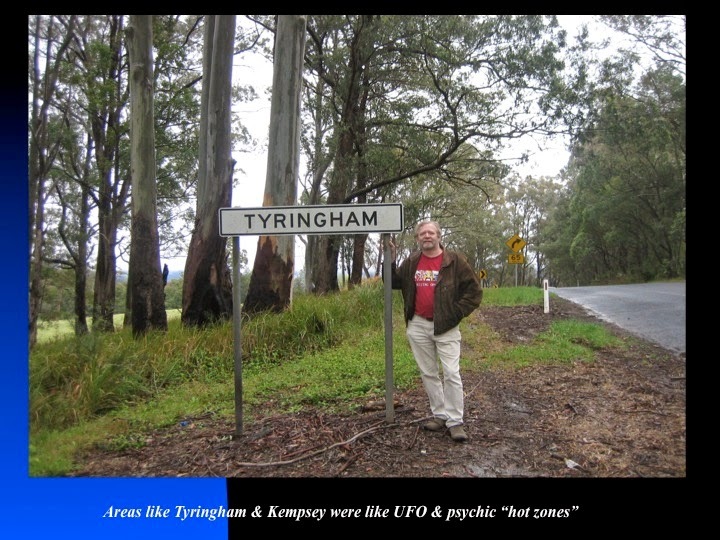 A more detailed account of this extraordinary case study can be found in Helen Hack's book "The Mystery of the Mayanup Poltergeist" (2000), which gives a great detail of intriguing detail about the UFO events inthat locality. 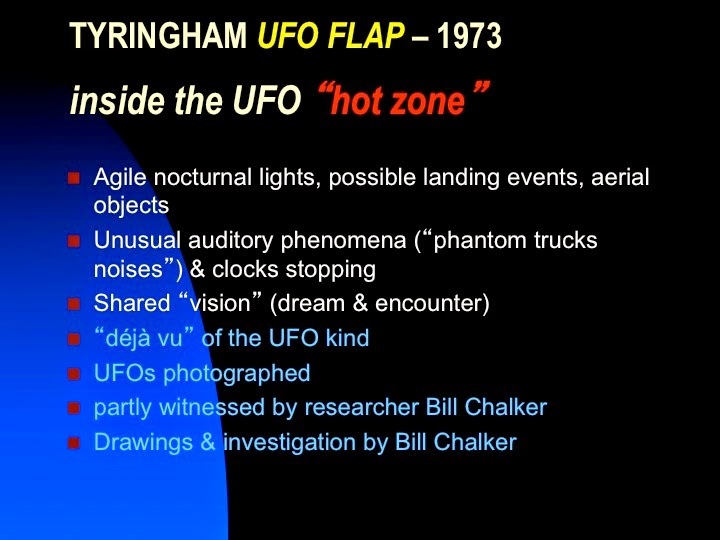 One of them included a farmer's extraordinary encounter with an apparent "solid light" beam on the same night as the 1967 Boyup Brook car event, indeed geographically very close to that event location - a striking confirmation of the UFO "solid light" "car stop" close encounter. In the farmer's experience he instinctively shut his eyes and put his hands up to shield them from the "intense light". He reported that when he opened his eyes ""his hand seemed to be semi-transparent with the veins showing in a blue network beneath the skin." He was not able to moved apparently for 5 or 6 minutes (the same kind of approximate duration in the car case on the same night) until the beam of light vanished. From the point of view of personal experience, deep research and analysis, the parapsychological connection is an area deserving serious investigation and research to determine what truly is that real nature of that connection.